Tea originated in China, so it’s only fitting that Chinese fast food joints embrace the beverage. Panda Express has done just that, rolling out Tea Bars at some of its outposts. 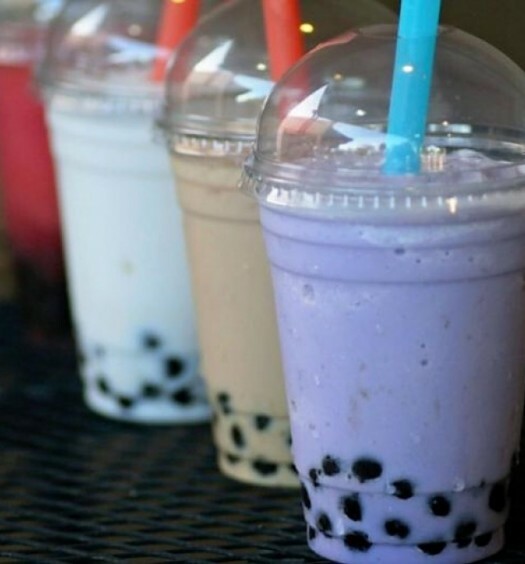 Offerings include Panda Express’s best-known option, Milk Tea, which can be served hot or iced, with or without tapioca pearls. Panda Express also has several fruit teas and lemonade teas, infusing your tea with a unique shot of sweetness. If you’re not into what Panda Express has cooked up, you can build your own tea. Here’s how it works: Start by picking a tea base of black, green, or oolong. Then pick a style: milk, citrus, berry, or tropical. Continue by specifying how sweet you want your tea to be, and then finish things off with an add-on: honey boba, jelly, pudding, aloe vera, or chia seeds. Panera serves hot teas from Republic of Tea, but it’s their iced beverages that have us dishing out the applause. Panera keeps it basic with iced green tea and an iced chai tea latte, but turns things up with its acai berry iced green tea (left) and its plum ginger hibiscus iced tea (right). The hibiscus tea includes pieces of apple, blackberry leaves, carob, ginger, and rosehips. How’s that for flavor? Wendy’s line of Fruitea Chillers™ highlights the burger chain’s enthusiasm for unique, tasty teas. The Blueberry Pineapple Fruitea Chiller (left) blends organic tropical green tea with blueberry puree and pineapple and pomegranate juices. And the Orange Mango Fruitea Chiller (right) pairs organic tropical green tea with mango puree, orange juice, and carrot juice. For those craving something less sweet, Wendy’s keeps it simple with Honest Tropical Green Tea and Unsweetened Ice Tea. Wendy’s launched a new slogan this year, calling its menu “deliciously different.” With these beverages, we have to agree. Caribou Coffee packs in the flavor on its tea menu, from pomegranate and mango to peach and mint. One of its most flavorful concoctions is the Pomegranate Vanilla Tea Latte, which pairs pomegranate oolong tea with sweet vanilla syrup and steamed milk. Its hot and iced tea selections include cinnamon spice, black mango, citron green, and mint varieties. The Minnesota-based chain also features a selection of sparkling teas, including green tea lemonade and peach black tea. Starbucks may be the most famous coffee chain in the world, but it’s also become quite the destination for a good cup of hot or iced tea. The Seattle-based business features an impressive bevy of teas with rich flavor profiles that include mango, citrus hibiscus, papaya, cinnamon, and lemongrass—and that’s just in one drink, the Passion Tango™ Herbal Tea! Other tea offerings from Starbucks include: jade citrus mint green tea, mango black tea lemonade, and the Youthberry White Tea, which includes notes of acai berry, hibiscus, candied pineapple, mango, and Fuji apples. Starbucks even offers its own PG-version of sangria with the Teavana® Sparkling Berry Sangria Herbal Tea. The fruity mixture combines Passion Tango™ tea with apple juice, berry flavors, blackberries, and orange slices. Starbucks recently released its first coffee/alcohol mashup with the Espresso Cloud IPA. Tea and alcohol have been a hot new couple at restaurants in recent years…Will we see them hook up at Starbucks anytime soon? Stay tuned.